Temperatures are heating up across the US, when this happens it can wreak havoc on the sensitive electronics in your facility. If you’re a follower of the EXAIR Blog, you’ve noticed that we’ve spent a great deal of time recently discussing the Cabinet Coolers. From a description of how they work, specific applications, as well as how to determine what size you’ll need, we’ve covered quite a range of topics. Equally important, though, is the NEMA rating of the Cabinet Cooler. I’d like to take a moment to discuss the different NEMA ratings for the Cabinet Coolers that EXAIR has to offer and where each should fit. NEMA 12 – The NEMA 12 rating is for enclosures that are indoor and provide a degree of protection to personnel against access to hazardous parts as well as prevent any materials from entering the enclosure such as dust, debris, or moisture from light splashing. This standard duty style of Cabinet Cooler is best served indoors on the shop floor where there aren’t any wash-down areas or excessive moisture. NEMA 4 – A NEMA 4 rated cabinet cooler is designed for either indoor or outdoor use. It, too, provides protection to personnel against access to hazardous parts and prevents dust, dirt, or debris from entering the cabinet. In addition to providing the same levels of protection as the NEMA 12, the NEMA 4 rating also means that the equipment will be protected from water such as rain, sleet, snow, splashing water, and even hose directed water. NEMA 4X – The NEMA 4X carries the same levels of protection as the NEMA 4, but also adds an additional level of protection against corrosion. EXAIR’s NEMA 4X Cabinet Coolers are constructed of either 303 or 316 Stainless Steel. EXAIR’s Cabinet Coolers are available from stock with cooling capacities ranging from 550 Btu/hr – 5,600 Btu/hr. With a variety of different materials and NEMA ratings, EXAIR has the right Cabinet Cooler ready to ship today to prevent your sensitive electronics from shutting down. Don’t let yourself get frustrated dealing with heat-related issues, get a maintenance-free Cabinet Cooler installed ASAP! Fill out the Cabinet Cooling Sizing Guide and an Application Engineer will be in touch with you within 24 hours with a quote for the most suitable model. We here at EXAIR always know when summer is approaching, as phone calls and orders for the Cabinet Cooler Systems start to kick into high gear. After those first few hot days in late spring, it is common for panels and electrical enclosures to overheat due to faulty air conditioning units, fans that are not working, or lack of a cooling system in general. Time for us to sharpen our pencils and be ready to help! Our Cabinet Coolers are in stock and ready to solve your overheating problems with same day shipping on orders we receive by 3pm. If you need assistance choosing your Cabinet Cooler Solution, Contact an Application Engineer today! EXAIR Cabinet Coolers incorporate the vortex tube technology to produce cold air from compressed air, all with no moving parts. Below shows the basics of how the Cabinet Cooler is able to provide cooling to an enclosure. Compressed air enters the vortex tube based system, and (2) streams of air are created, one hot and one cold. The hot air is muffled and exhausted through the vortex tube exhaust. The cold air is discharged into the cabinet through the Cold Air Distribution Kit and routed throughout the enclosure. The cold air absorbs heat from the cabinet, and the hotter air rises to the top of the cabinet where it exits to atmosphere under a slight pressure. Only the cool, clean, dry air enters the cabinet – no dirty, hot humid outside air is ever allowed into the cabinet! EXAIR offers Cabinet Cooler Systems for cabinets and enclosures to maintain a NEMA rating of NEMA 12 (dust tight, oil-tight), NEMA 4 (dust tight, oil-tight, splash resistant, indoor/outdoor service) and NEMA 4X (same as NEMA 4, but constructed of stainless steel for food service and corrosive environments. Cabinet Cooler Systems can be configured to run in a Continuous Operation or with Thermostat control. Thermostat control is the most efficient way to operate a Cabinet Cooler. They save air by activating the cooler only when the internal temperature reaches the preset level, and are the best option when fluctuating heat loads are caused by environmental or seasonal changes. The thermostat is preset at 95°F (35°C) and is easily adjusted. Another option is the ETC Electronic Temperature Control, a digital temperature control unit for precise setting and monitoring of enclosure conditions. An LED readout displays the internal temperature, and the use of quick response thermocouple provides real time, accurate measurements. The controller has easy to use buttons to raise or lower the desired cabinet temperature set-point. EXAIR NEMA 4X 316SS Cabinet Cooler System with Electronic Temperature Control installed on control panel in a pharmaceutical plant. High Temperature – for ambient temperatures of 125°F to 200 °F – for use near furnaces, ovens, etc. 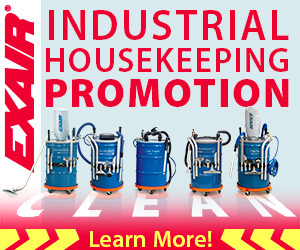 Non-Hazardous Purge – ideal for dirty areas where contaminants might normally pass through small holes or conduits. A small amount of air (1 SCFM) is passed through the cooler when the solenoid is in the closed position, providing a slight positive pressure within the cabinet. Type 316 Stainless Steel – suitable for food service, pharmaceutical, and harsh and corrosive environments. If you have any questions about Cabinet Coolers or any of the EXAIR Intelligent Compressed Air® Products, feel free to contact EXAIR and myself or one of our Application Engineers can help you determine the best solution. The IP Code, otherwise known as ‘Ingress Protection’, ratings are defined in the international standard EN 60529 (or European IEC 60529.) Similar to NEMA ratings by the National Electrical Manufacturers Association, the IP ratings are used define the level of sealing effectiveness of enclosures against penetration from foreign matter and water/moisture. The ratings for an enclosure are determined by actual testing. The IP number is composed of the letters ‘IP’, two numbers and possibly one or two letters. The first number refers to the protection level against solids, and the second number to the liquid protection level. The higher the number, the greater the protection level. The optional letter codes relate to protection of persons against access to hazards within the cabinet, and any other special notice. Here at EXAIR we work with IP ratings everyday. The Cabinet Cooler System line of products are made to keep electrical enclosures cool inside, while maintaining the integrity of the enclosure IP Code rating. If you would like to talk about IP or NEMA ratings and the Cabinet Cooler Systems or any of the EXAIR Intelligent Compressed Air® Products, feel free to contact EXAIR and myself or one of our Application Engineers can help you determine the best solution. Industrial facilities incorporate a variety of processes and procedures to meet customer demands. The ability to convert incoming resources into the desired output hinges upon proper up-time inside of the facility. Whether producing raw materials, performing value-adding services, or manufacturing consumer goods, downtime and failed systems inside of an industrial facility mean lost throughput, lost profit, and increased cost. As temperatures begin to rise across the US, heat related equipment failures become more prevalent. Industrial facilities need a way to alleviate the problems caused by these increased temperatures and to mitigate the risk of failing electrical devices due to heat. 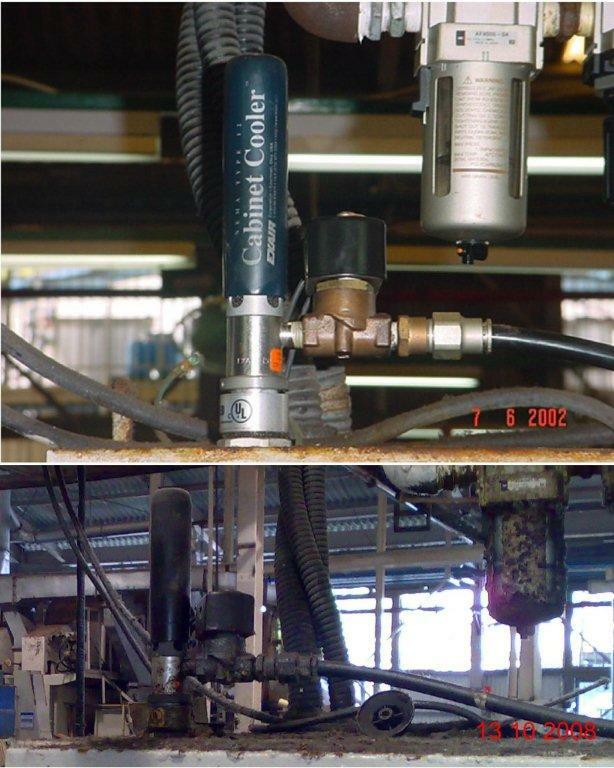 EXAIR Cabinet Coolers provide this solution using nothing but compressed air. 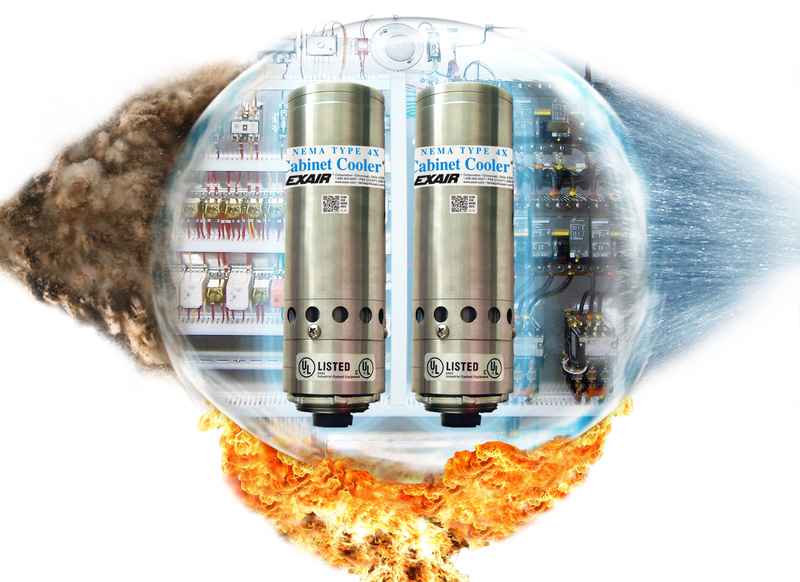 EXAIR Cabinet Coolers convert a source of compressed air into a very cold stream of air, capable of cooling a sealed enclosure. They are mounted directly to the enclosure, feeding in air as low as 18°F (-8°C) to bring the internal temperature of the cabinet down to acceptable levels. While the cold air generated by the Cabinet Cooler is fed into the enclosure, hot air is simultaneously removed, maintaining relative humidity inside the enclosure at 45%. Rated for use in NEMA 12 (IP54), NEMA 4, and NEMA 4X (IP66) environments, EXAIR Cabinet Coolers are available in aluminum, 303 stainless steel, and 316 stainless steel. No matter the material of construction, EXAIR Cabinet Coolers can provide 275 – 5,600 BTU/hr. 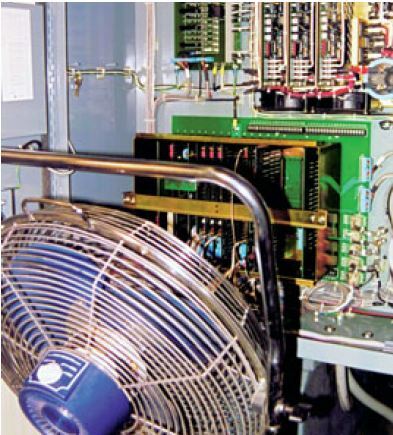 of cooling capacity in industrial applications with ambient temperatures up to 125°F (52°C). For hotter environments up to 200°F (93°C), High Temperature Cabinet Coolers are available. In extremely dirty environments, Non-Hazardous Purge systems provide a continuous stream of air (1 CFM) into the enclosure, maintaining a positive pressure and preventing any dust intrusion. Each system type and material are available to ship from stock*, allowing fast delivery to your facility and quickly solving an overheating condition of your devices. Never do this! This setup forces dust and contaminants into the control panel, compromising the electrical components inside. Fans and traditional air conditioners can effectively remove heat, but they provide no separation between the sensitive components inside of an enclosure and the dirty industrial environment outside. Simply installing a fan or AC unit can allow dust, oil, and other ambient contaminants into the enclosure, leading the failure of the expensive equipment inside. And, these solutions degrade over a finite lifespan (the Cabinet Cooler does not), they require routine maintenance (the Cabinet Cooler does not), and they need more time to install (Cabinet Cooler installation is fast and simple). Curious how easy it is to install an EXAIR Cabinet Cooler? Check out this video and see just how easy it really is. All EXAIR Cabinet Coolers are available with thermostat controls to regulate internal cabinet temperatures and compressed air consumption. EXAIR thermostats feature a bimetallic contact strip to open and close the electrical circuit in response to air temperatures. These thermostats quickly respond to changes in air temperature and are specifically suited for their intended use. Preset for 95°F (35°C), a suitable temperature for most electronic devices, these thermostats are fully adjustable for specific application needs. In the event a more sophisticated thermostat control is needed, Electronic Temperature Control units can be implemented. These standalone units utilize a thermocouple to determine internal cabinet temperatures which display onto a digital readout. Push-button controls on the digital readout board allow for easy modification of the internal cabinet temperature set-point. When the desired internal temperature is reached, the Cabinet Cooler will turn off automatically. (Click for larger view) The image on top shows year one of the Cabinet Cooler’s life, and the image on the bottom shows year six. An automotive radiator manufacturer experienced a problem with an overheated motor drive, causing one of their production lines to come to a stop. The root cause of the failure was a leaking refrigerant-based air conditioner, which failed and allowed water into the enclosure housing the motor controls. When the water entered the enclosure, it shorted the motor drive and caused the production line stoppage. The new drive cost over $20,000 and a month of down time to purchase, receive, and install. Following this failure, the customer searched for a more suitable cooling solution and installed an EXAIR model 4330 NEMA 12 2,000 BTU/hr. Cabinet Cooler System. With an included thermostat control, this system provided proper cooling for the application without any need for required maintenance or potential to leak water into the enclosure. Fast forward six years and this same customer reached out to EXAIR for another application. During the conversation they mentioned the Cabinet Cooler they purchased many years before was still in operation, still providing proper cooling for the enclosure, and that no maintenance had been performed (Cabinet Coolers do not require routine maintenance). Even in the dirty industrial environment of this manufacturing facility, the EXAIR Cabinet Cooler continued to function flawlessly. When exploring industrial solutions, required routine maintenance is a common concern. The cost of replacement components and time required to perform necessary maintenance weigh heavily on decision makers. Fortunately, EXAIR Cabinet Coolers do not require any maintenance, and with clean, dry compressed air their lifespan can be 20 years or more. There are no moving parts to wear out or routine maintenance services to be performed. If you’re in need of a suitable cooling solution for an industrial enclosure, consider an EXAIR Cabinet Cooler. They’re smaller than traditional AC units, faster to install, and require little-to-no-maintenance. Feel free to contact an EXAIR Application Engineer with any questions, or fill out our online Cabinet Cooler Sizing Guide to have an Application Engineer contact you. *Orders received by 3pm Eastern time will ship same-day. Summertime temperatures get hot. Protect your electronics with an EXAIR Cabinet Cooler System. 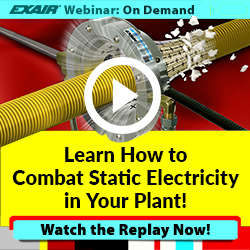 As you may have seen in our most recent E-NEWS Special Bulletin, or experienced in real life (depending on where you’re located,) most of the eastern United States is seeing a pretty significant heat wave for early summer…or, as we call it at EXAIR, “Cabinet Cooler Season.” And this year is kicking it off with a bang, for sure. On Tuesday, when the E-NEWS email went out, I was on the phone, processing an order for a Model 4340 NEMA 12, 2,800 Btu/hr, Thermostat Controlled Cabinet Cooler System, to ship overnight to a user who wanted to protect the new drive they were replacing because theirs overheated. They were up and running before noon on Wednesday. I don’t know what the rest of the summer holds in store, but I know this: if you have concerns about protecting sensitive, critical, and/or expensive electrical & electronic enclosures, EXAIR Cabinet Cooler Systems are the solution you’re looking for. Easy to install. Maintenance free operation. Durable, UL Listed, and CE Compliant. If you’d like to discuss your application and get one for yourself, call me; let’s talk. Selecting the proper Cabinet Cooler to solve your electrical panel overheating problems is simplified by using the Cabinet Cooler Sizing Guide and allowing EXAIR Application Engineers to calculate which Cabinet Cooler will be best. It is important to size Cabinet Coolers properly to ensure the most efficient cooler is chosen and the proper NEMA rating is chosen for your cabinet. This video illustrates how simple it is to gather the information for a long term solution to heat related problems. Cabinet Coolers install in minutes, not hours. They protect your electronics from seasonal hot weather spikes, normally high temperature environments, or too much heat dissipation from electrical components in an enclosure. EXAIR’s selection of Cabinet Coolers include NEMA 12, 4 and 4X ratings. They normally operate with a thermostat control to turn themselves on and off as needed throughout the years and this is the most efficient way to run them. They are available from stock to solve your problem quickly and will fit nearly any environment with a variety of materials (Aluminum, 303 stainless steel or 316 stainless steel) and temperature ratings. If you have any questions, please contact EXAIR.